Yorkshire terriers were first introduced in the United States in the early 1870s and became a very popular dog with the fashionable set. The breed's popularity increased in the 1950s and they are a standard breed in many homes today. Known for its small stature and size (3-4 pounds) and its silky blue and tan coat, it makes an excellent companion. The Yorkie is very loyal and protective of its owner and is active and energetic. This breed has a very distinctive coat which is long and silky and usually parted down the middle of the back. Talk to your breeder before buying a Yorkie puppy and bringing him into your home. The breeder can give you the puppy's breeding papers and tell you its lineage. Knowing the traits of the parents of the Yorkie will give you great insight into its physique and coat when full-grown, as well as its unique traits. Brush and groom your Yorkie puppy immediately upon adopting or buying the dog. This will ensure that its coat grows long, straight and silky right away. The hallmark of this breed is hair that hangs down and can grow long enough to drag on the floor with a part down the middle. You can see to it that your Yorkshire terrier pup's hair will be long and straight if it is brushed right regularly and often from puppyhood on. Wavy, short hair will be the trademark of a Yorkie that is not brushed and groomed regularly. The wavy coat is considered the puppy cut for a Yorkshire terrier. It is a short-coat style that many people have on their Yorkie because it is easy and convenient. When hair is shorter it waves up. 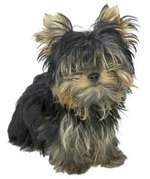 If you leave your Yorkie's hair free-flowing it might develop very wavy hair. Having long, straight hair with a blueish tinge is a trademark of the Yorkshire terrier breed, so if you are planning on showing your Yorkie at dog shows you will want to keep its coat long with silky, shiny hair. The shorter the cut on the Yorkie puppy the wavier the hair will be.